Snowpack Summary for Friday, February 1, 2019 4:24 PM Significant winter weather is on the table for this weekend and next week. Overall: Avalanche hazard will start increasing Saturday afternoon, February 2nd. Today (Friday, February 1st) natural and human triggered avalanches are unlikely. By Saturday afternoon, new snow accompanied by southerly and westerly winds will increase the likelihood of human triggered avalanches. The potential for a more significant and colder system remains on the table for Tuesday and Wednesday, and avalanche hazard may stay elevated this week. Persistent buried weak layers could be re-energized by the load of significant new snow. New snow loads of more than a foot in 24 hours, or 8 inches in 12 hours with wind are causes for concern. Please make slope specific evaluations by digging test pits and performing stability tests, especially if the forecasted storm fall materializes. The past week has been dry and breezy. High sustained wind between 15-35 mph occurred on January 26, 27 and 28th. The strongest winds were out of the northeast, shifting to the north and moderating as the week progressed. Gusts over 50 mph were recorded on all three of these days. Loading of windblown snow was limited by the ever increasing lack of snow available to transport, as most of it is already packed into hard wind slab or returned to the atmosphere from the impressive wind events the week prior. Still, snow plums were observed on the ridge tops potentially loading southwest and south facing slopes at and above treeline. Snowpack stability tests indicate poor to moderate structure, moderate strength and moderate to low energy. Recent temperature gradients may indicate a transition from building weak facets to general strengthening of the snowpack. 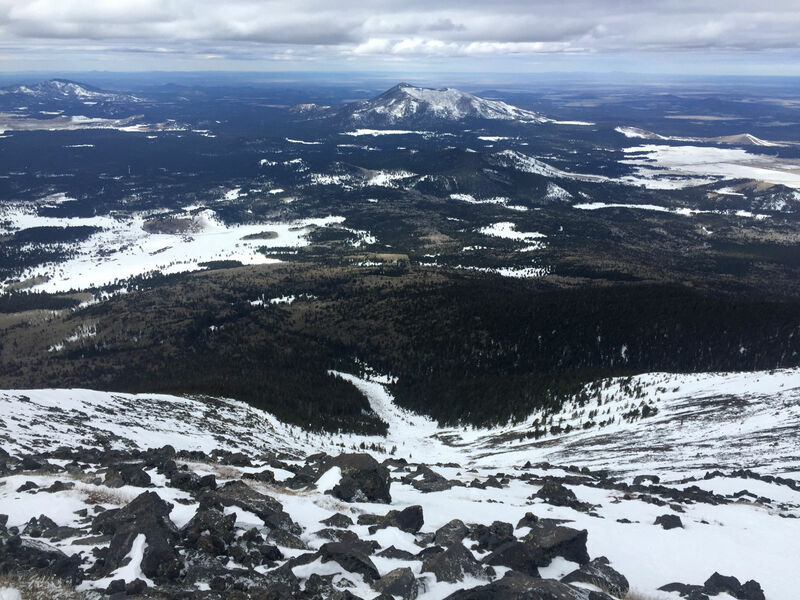 New precipitation could load the snowpack sufficiently to cause a failure. Near and Above Treeline:Many alpine slopes have been scoured by winds (photo below). By Saturday evening and Sunday, watch for new wind slab development on north, northeast and east aspects. Post storm winds may create slabs on other aspects. As always, watch for cross loading in gullies. The new snow may have a hard time adhering to relatively slick hard-snow and crusts. Surface hoar (photo below) has been observed near treeline. Watch for new slab development above preserved surface hoar, these will be particularly reactive. Snow depths near and above treeline range from 51" (130cm) to 0. Wind scoured zones have reduced the snowpack down to bedrocks in some areas. Sun and wind have conspired to create hard snow. Crampons may be helpful. Below Treeline:Persistent slab instabilities may still exist in our snowpack. A reactive, faceted weak layer exists about 30 to 45cm from the ground, primarily on northwest, north and northeast slopes, near treeline and below. Carefully assess run out zones and terrain traps. Currently 20" to 40" (~50 to 100 cm) of snow cover can be found between 9,000 and 10,000', with more above. Current forecast for snow and wind suggest wind slab hazard will become and issue by Saturday evening and Sunday morning. Watch for new wind slab development on north, northeast and east aspects. Post storm winds may create slabs on other aspects. As always watch for cross loading in gullies. 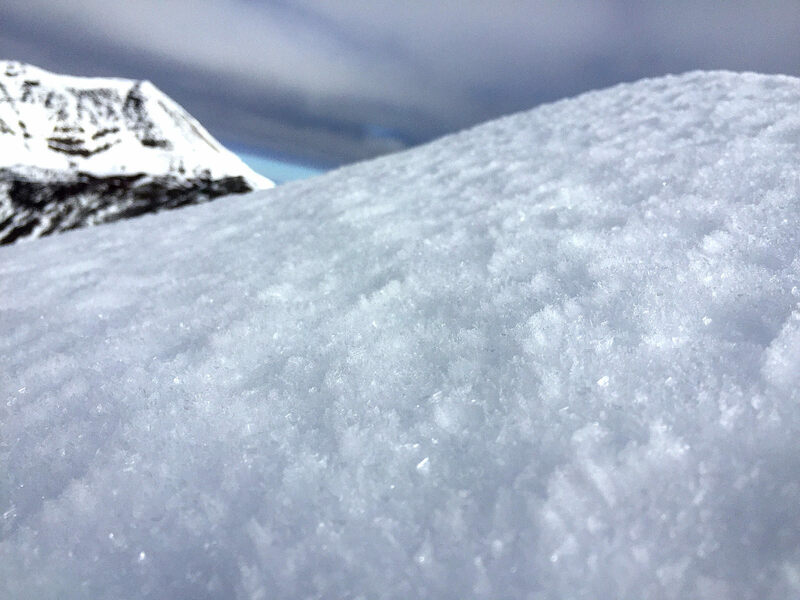 New snow may have a hard time adhering to relatively slick hard-snow and crusts that exist near and above treeline. Slopes just below ridges and on the flanks of shoulders should be considered suspect. Our persistent slab problem danger has decreased over the last week or so. However, new snow plus a human trigger may be enough to collapse a persistent weak layer on some steep and isolated slopes, primarily near and below treeline on northwest, north and northeast aspects. Surface hoar observed on Agassiz Peak above treeline, Thursday, January 31st. Watch for preserved surface hoar buried by new snow, as this would become a reactive weak layer. Photo by Paul Dawson. Above treeline wind scour in Alison Clay Bowl. January 31st photo by Paul Dawson.